See the watering group map below. 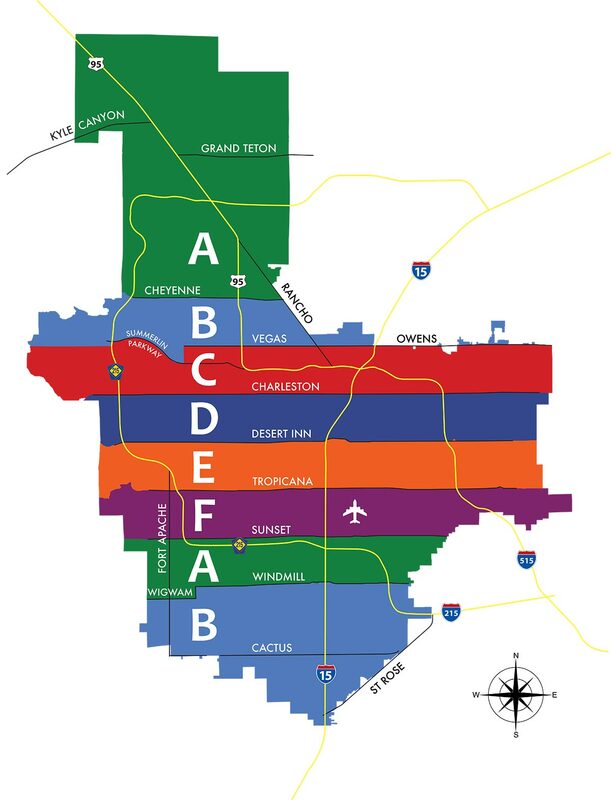 However, if you are not sure what watering group your property belongs to, go to https://www.lvvwd.com/conservation/mandatory-watering-schedule/ and enter your address. Water is what all your plants need, but knowing when to use the proper irrigation and how can be challenging for most of us. The volume of water needed for all your plants varies with the types of plants your garden has. Some plants are not that pretentious, while others may require heavy irrigation, especially during the hot season. Thing is that the choice between an in-ground watering system or overhead sprinklers will have huge impact on your results. At Irrigation Solutions Las Vegas, we provide you with full specific solutions for your garden so you can keep your surroundings attractive and alive. Each winter we receive numerous calls to repair or replace broken and frozen exterior backflow preventers, landscape irrigation pipes and vacuum breakers due to expansion and contraction of dissimilar materials caused by freezing or sub-freezing temperatures. Some simple, do-it-yourself, protective measures may prevent a visit by your friendly and sometimes expensive technician. Cover your exterior hose bibs (outside faucets) with styrofoam covers available at your local home centers for less than $5.00. You can also cover the hose bibs with a small piece of insulation, cardboard, a towel or small blanket wrapped with duct tape, in an emergency. Your landscape irrigation system has an exposed vacuum breaker in your yard. Because this device is metal and it transitions to P.V.C. plastic pipe, it must be covered during freezing temperatures. Draining your irrigation lines and turning off the water source can prevent expansion and broken water pipes. If your pipes freeze, thaw lines safely using hair dryers or electric lamps - never use an open flame or torch. Do not open the water meter box at the curb. Opening the box could increase the chance of freezing the flowing water at the meter. Irrigation Solutions of Las Vegas is here to serve our community, and one way we want to help serve is by providing little bits of information that can make a big difference with your landscaping. By following the Southern Nevada Water Authority (SNWA) watering schedule (pictured above), you can avoid paying unwanted and unnecessary fees or dealing with violations. Your approved scheduled days (Monday - Saturday). Watering on Sundays is NOT allowed for anyone, anywhere, anytime of the year in the Las Vegas Valley area. In this Las Vegas climate, the seasons can blend into each other and you can't wait always wait for the weather to change in order to know when to change your sprinkler system. Below is a quick list of the start dates to change your controller for the seasons. Also, you can set these dates in your calendar as a reminder to change your controller accordingly. Grass thinning happen due to inadequate conditions such as too dry or too cold, no sun or too much sun, too much watering, etc. When individual grass plants die, the grass thinning occur. Golf courses in Las Vegas experience grass thinning yearly and areas of the golf course must be re-seeded periodically. The re-seeding is normally done early spring or in the fall. Seeding during very hot or very cold temperatures slows down or eliminates the germination process needed for a seed to grow into a plant and the seed may completely die. The amount of water transmitted to the seed is also important for a successful growth of the new plant. There are multiple grass types available and each has different needs regarding resistance to temperatures, sun exposure, watering, soil consistency. Make sure you follow the instructions provided when you purchase the seeds and call us if you need additional help. Springs Preserves offers gardening classes and workshops to Las Vegas residents, discussing topics such as planting schedules and how to's, seeds and propagation techniques, creating wildlife-friendly gardens and landscapes, and other topics that can help you decide when and what to plant in your garden. There is normally a small fee for attending the classes and workshops. You can buy tickets and register for the upcoming events on the Springs Preserves website. Water your lawn using the cycle and soak method. The mandatory watering schedule also applies to customers with drip irrigation. EZ-FLO is one of the leading manufacturers in irrigation and sprinkler products. Their systems can be connected to a hose bib, a drip system or an irrigation system. The EZ-FLO’s patented flow process automatically adjusts to changes in water pressure and water flow without changing fittings. Additionally, fertilization using virtually any type of liquid or water soluble product, can be automatically fed to the plants through the irrigation water in an environmentally friendly safe and easy manner. This technique of applying products through the water is called “fertigation”.